Prince Harry, Duke of Sussex and his wife Meghan’s last official foreign tour before becoming parents, was set to focus on initiatives promoting girls’ education, women’s empowerment and the inclusion of people with disabilities. 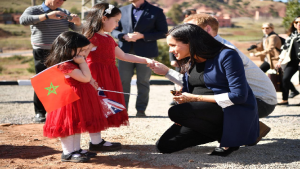 The royals met with Moroccan schoolgirls in the foothills of the High Atlas mountains, before heading to the capital for a reception on Sunday. The organisation runs free boarding houses to give girls aged 12 to 18 from the High Atlas region access to education, working with 185-teenagers in 2017. “Wow, that’s impressive!” Meghan told a girl who has ambitions to study astronomy, in an exchange filmed in a dorm room and posted on Twitter by Kensington Palace. The couple also visited a classroom where pupils were practising their English, according to the royals’ social media account. A quarter of Moroccans aged 15 to 24 are out of work and not in training or education, according to official data for 2016, a figure which rises to 44 for girls and young women. “Medical provisions” had been made on the trip for Meghan, who is due to give birth in the spring, according to official sources. The royal visit was described by Britain’s ambassador to Rabat, Thomas Reilly, as an “important opportunity to promote the strong relationship between the British and Moroccan people”. London is aiming to replicate Rabat’s trade deal with the European Union once Britain leaves the bloc, the diplomat added. On Monday the Duke and Duchess of Sussex, as they are formally known, will attend a horse riding program for young disabled people in Rabat. The post Harry and Meghan attend a reception at the British Residence in Rabat appeared first on SABC News – Breaking news, special reports, world, business, sport coverage of all South African current events. Africa's news leader..